It's springtime. Something we love here at Cycle Chic. Something that everyone loves, not least the Nordic peoples. It's time to crawl out of hibernation and embrace humanity in the sunshine and light. To understand just how important the light is to us here in Copenhagen, be sure to read this post about Lux. Above you see one of the very surest, anthropological signs of spring, from just the other day. Someone checking someone else out. It's one of the added bonuses of bicycle culture. You are elbow to elbow with your fellow citizens on the cityscape. Surrounded by humanity, without glass and steel barriers on four wheels to restrict your view or your sense of community. We've had several photos with this very human, anthropological theme over the past few years, and I figured I'd put them all into one post. Peruse our shots of women checking out men and men checking out women. 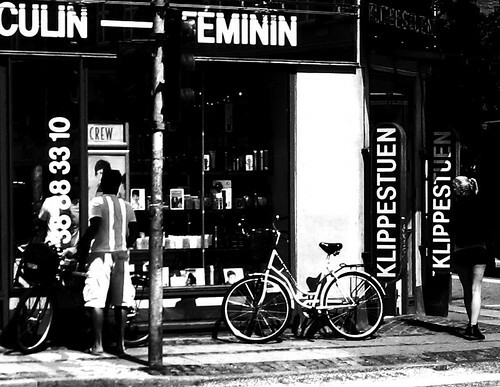 This being Copenhagen, we're certainly open to men checking out men or women checking out women, we just haven't captured those human moments of yet. Denmark is regularly selected as one of the happiest countries in the world. Every year, some journalist equates this rating with the fact that we ride bicycles and 'riding bicycles makes you happy'. That may be true in some sense, but I believe that a main factor of this happiness is because we live in cities where we, the people, are not hidden away in cars, peering at each other through rear-view mirrors. We are one with the urban landscape. 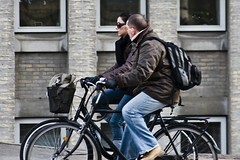 We define it with our prescence on bicycles, exposing ourselves openly to our fellow citizens and to the city at large. 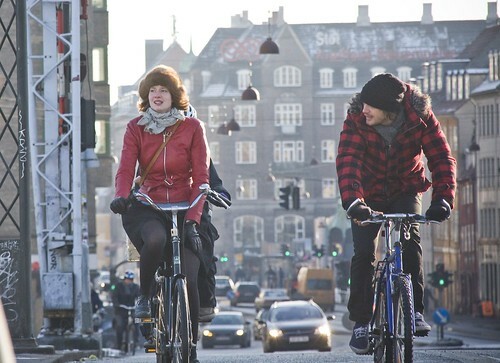 One of the greatest tools for creating truly liveable cities is the bicycle. Encouraging citizens, through safe infrastructure, to ride. The health benefits are enormous, the benefits on pollution reduction and fewer traffic injuries are as well. But what also happens is that the social fabric of the city is woven tighter. Stronger. In richer colours and with finer thread. You return to where cities use to be before car culture and the motorization of society. Places inhabited by people. With people present on the streets. As pedestrians or on bicycles. From cityscape to humanscape. Excellent post! I'm from Wellington, New Zealand and I've just started cycling around the city - stylishly, bien sur! I've had many compliments and admiring looks already. Hopefully the trend will catch on in Wellington. You really hit the spot with this post! I especially like the one with the older man and woman. The weathered basked on her bike is a very nice touch. These are so nice !! Fantastic post! Exactly my way to practice bicycle, and what I would like to see one day here in Paris! Wonderful photos, as always! I really loved this post...and you're right, that cycling in spring is perfect for people-watching! Great post! 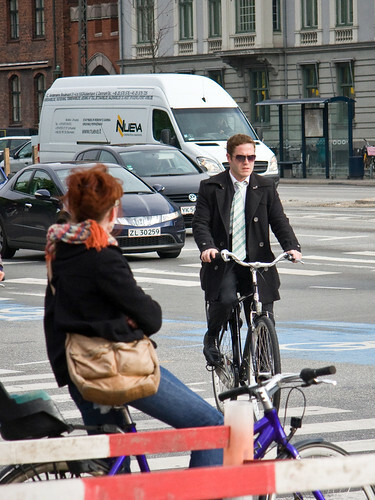 We just moved to Copenhagen 3 weeks ago...and can't wait to start cycling everywhere. This is one of the things that drew us to this city!